Holland America Line’s Koningsdam will soon have a sister. 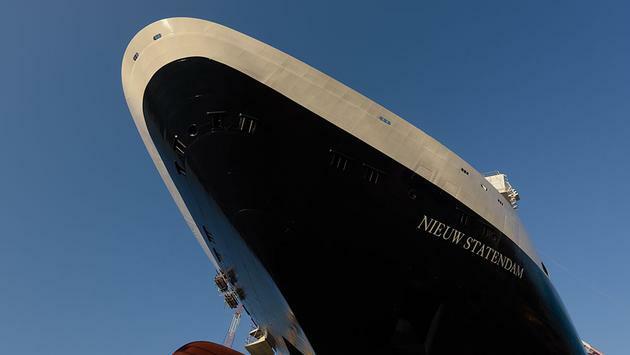 The company recently celebrated the Nieuw Statendam at its coin ceremony at the Fincantieri shipyard in Marghera, Italy. The traditional event was overseen by madrina Anne Marie Bartels, a member of Holland America Line’s President’s Club, ahead of the ship’s pending float-out. In a show of good luck, a historic coin was welded onto the forward mast by Bartels, Antonio Quintano, director of the Fincantieri Marghera Shipyard, and Keith Taylor, executive vice president, fleet operations for Holland America Group. Speeches and a blessing from the shipyard chaplain capped off the ceremony. “The coin ceremony is one of the most time-honored traditions in the building of a ship, and having Anne Marie, one of our most valued guests, serve as Madrina makes the celebration all the more special,” said Orlando Ashford, president of Holland America Line, in a press release. The guilder is appropriately from 1898, marking the year the line’s original Statendam launched. Bartels herself first cruised aboard Holland America Line on the s.s. Nieuw Amsterdam from Rotterdam to New York when she was 21. Since then, she has sailed on 79 cruises with the brand, including a dozen Grand Voyages. Also in attendance was Cyril Tatar, Holland America Group’s vice president of newbuilding services. The festivities additionally featured the brief opening of a drydock gate to let water initially touch the Nieuw Statendam’s hull. The ship will be floated out entirely on December 21, 2017, when it will be positioned at the outfitting pier. The 99,500-ton, 2,660-guest Nieuw Statendam will carry over much of the same design as the Koningsdam but will also reflect its own look with exclusive venues and a fresh aesthetic from hospitality designer Adam D. Tihany and designer and architect Bjorn Storbraaten. Like its predecessor, the ship will feature musical instrument-inspired elements, as well as grand visual spaces. The Koningsdam was a step in a more modern direction for Holland America Line, and while the Nieuw Statendam is expected to continue in that vein, the ship will also honor the brand’s heritage. Following the Koningsdam, which debuted in April 2016, the Nieuw Statendam will be the second Pinnacle-class ship in the Holland America fleet. A third is scheduled to come into service by 2021.